Discover some of the most beautiful and historical treasures of Switzerland. This website is dedicated to promoting and discovering the architectural and historical landmarks of this country. Many of the monuments were along some of the most important trade routes in Europe while others are simply "neuveau riche" homes built in the last 200 years. There are over 500 castles and forts distributed throughout the country. Not all are restored and many will remain ruins. This is a selection of some of these buildings. This is your hub to help you find the castles you want to discover and explore. All the these landmarks have been visited by the author of this website and all the pictures taken are while visiting these beautiful places. 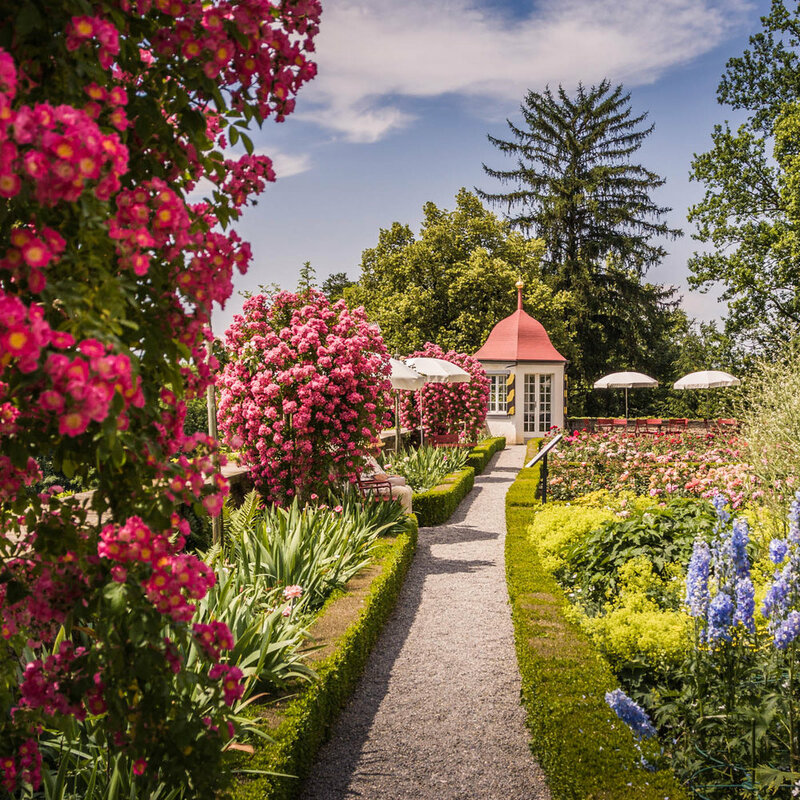 A miniature garden paradise with a love for roses and a spectacular view of the surrounding landscape and alps. Heidegg castle sits on it’s pedestal overlooking 800 years of history that has been lovingly restored for all to enjoy, young and old. This beautifully restored castle with moat and turrets is now a popular location for weddings and events. The castle was once owned by Colonel Ludwid Pfyffer, “Roi de Suisse” an important Swiss political figure from the 16th century. Following a fire in 1963 that nearly destroy the manor house, the canton of Lucerne purchased the ruin and established a foundation to restore the moated castle to it’s former glory. All be it the castle isn’t open to the public, it still is a remarkable example of the effort taken to save a beautiful monument. Cinderalla or maybe Snow White, whichever, this castle is for romantic adventures with a happy endings. Meggenhorn castle is a fairy tale castle sitting on a hill that overlooks lake Lucerne, Lucerne city, Pilatus, Rigi and the Alps that span along the whole horizon. How much more cheesy can you get. The manicured gardens flow around the building, inviting to sit and enjoy the flowers and ponder the spectacular view. The many castle windows and turrets invite to dream even more. Why are you still here, a romantic dream is waiting to be experienced. 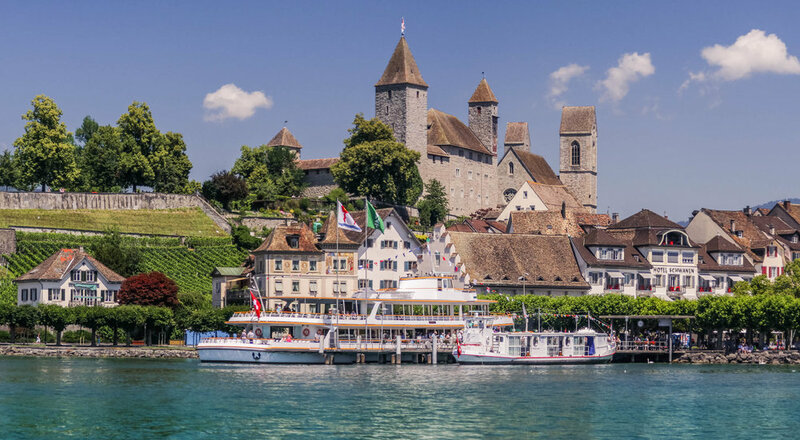 Located at the bottom of lake Zurich, Rapperswill castle dominates above the harbor and the old town. Restored in the 19th century, it now houses the Polish museum and other exhibitions sponsored by the museum. The park that surrounds the castle is very popular because of the view overlooking the rooftops, lake, harbor and the alps. Many visitors will also spend time walking through the historical inner city, enjoying the beautiful architecture and wonderful atmosphere. The walk along the lake is also a popular excursion and all of this is easily accessible by foot. Chillon Castle sits on an small island along the shoreline of lake Geneva in the canton of Vaud. It is situated at the eastern end of the lake, between Montreux and Villeneuve. It’s one of the most visited castles in Switzerland. 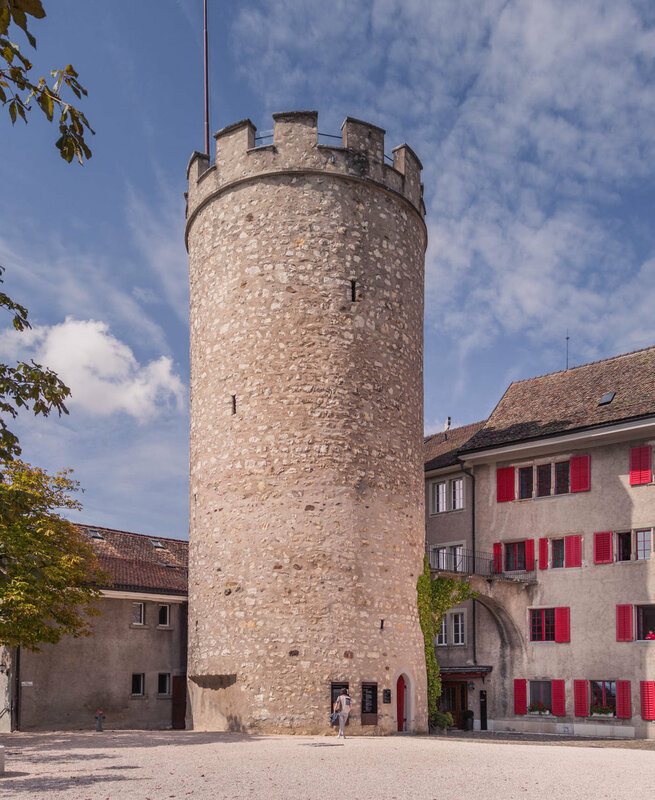 Opened up to the public in 1986, this wonderfully restored medieval castle is a very popular attraction in the Aargau region. The castle is also one of Switzerland’s oldest and most important castles, with a long history of counts and dukes having lived there. With it’s commanding placement over the town of Lenzburg and the surrounding region, the castle has been the place of settlement since Neolithic period. Today the castle is a popular tourist attraction as well as offering the use of it’s space for weddings, business and cultural events. All of this is set in a beautiful medieval surrounding, with an impressive courtyard and garden. This also is the ideal castle for a family outing, were the kids have plenty of learning activities that they can experience while exploring the castle museum. 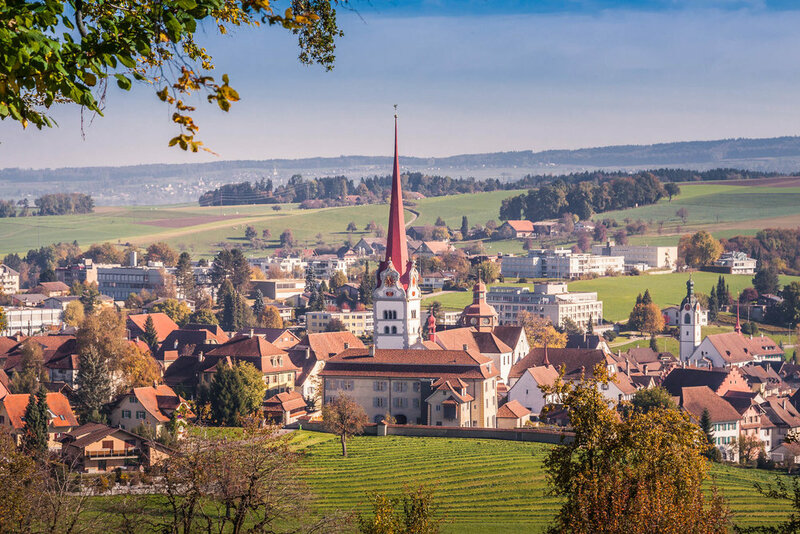 Probably one of the best kept secrets in the canton of Zurich, Kappel am Albis abbey stands out with it’s church spire over the rolling countryside that is dotted by small towns and farmland. Situated on plateau, the view of the alps and the city of Zug and its lake only add to the magic of the region. Historically the abbey is also located on a famous battle field that took place in 1529. The battle however was never fought and the famous story of the Kappeler Milchsuppe became legend. The opposing troops decided to share their food rations while diplomatic talks where being held. In the end a diplomatic compromise was found and no lives where lost. Maybe the real reason for not going to war was the breathtaking view that overwhelmed the combatants so much so they decide it wasn’t worth spilling any blood that day. Mirror, mirror, on the wall, – who is the fairest one of all? The answer is Hallwyl castle with it’s beautiful moat, presenting the perfect reflection in emerald colors of the castles walls, it’s turrets and bridge. The Castle is one of the most important moated castles in Switzerland. It's located on two small islands in the River Aabach, on the northern end of lake Hallwil. Beautifully restored, it's a pure delight to visit and explore. Perfectly manicured, a charming museum with shop and restaurant, the castle is a perfect escape form city stress. Propped up on a hillside overlooking the river Aare the castle has a commanding view over the entire valley below. Terraced with vineyards and gardens and a beautifully managed rose garden, the castle invites to discover it’s many facets, inside and out. In 2011 the castle was renovated and now belongs to the canton of Aargau. Wildegg is at the top of a string of castles that include Lenzburg castle, visible just to the south, Hallwyl castle in the middle, and at the bottom Heidegg castle. Wildegg has it’s own charm, with plenty of things to discover for younger and older generations, from the outside all the way to it’s most inner core. If your are going to stage a castle hopping tour, it might be a good idea to start here and work your way southwards on a journey through medieval history. The Villa Patumbah was built between 1863 and 1885 for Karl Fürchtegott Grob. 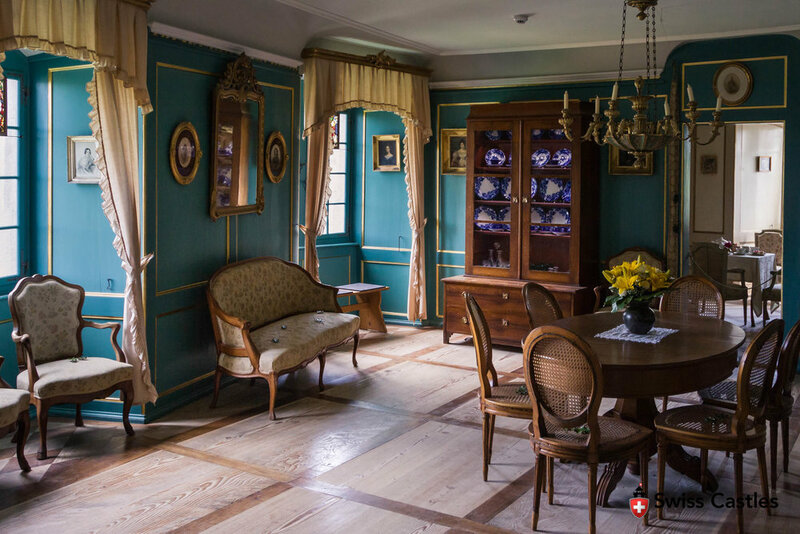 The villa is one of the most important witnesses of historicism in Zurich and is a protected monument. Mauensee Castle located close to Sursee in the canton of Lucerne, is a privately own property located on a small island with a private wooden bridge to access the island. Located on a hilltop, the original castle walls no longer exist and have been replaced by a ring of buildings that now make up the hilltop town. All that remains now is a tower that over looks the village below and the fantastic view that extends all the way to the boarders of Germany. Perched up above Uster on a small hill, this inconspicuous castle is ignored by the passing traffic below. Of little historical importance and now converted into a school, Uster castle will never gain the same share of attention as some other castles in the region like Kyburg castle. Einseideln abbey is one of the largest monasteries in Switzerland. 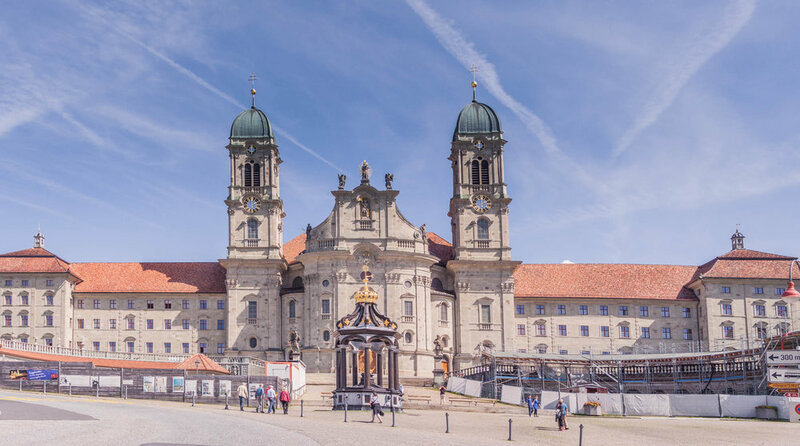 Its imposing church in the Baroque style have made it one of the most popular tourist attractions in the country. Alone the size of its grounds and different buildings that surround the main church are an indication of how important the abbey once was and still is. Today it still supports a large number of different trades that are needed to keep the grounds and its buildings functioning. The monastery also boasts it's very own stables and vinery as well as very beautiful library. The adjacent town of Einsiedeln has also become very popular with tourist, that enjoy the local specialities and shops. 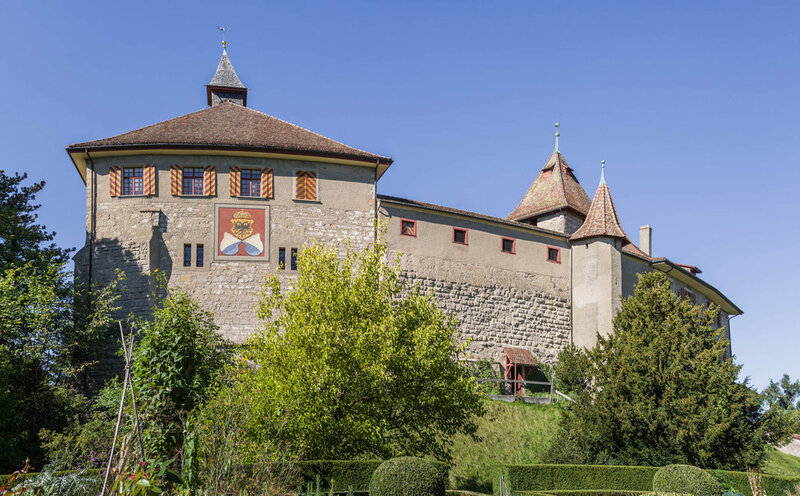 Kyburg, one of the oldest castle museums in Switzerland and an important stop for castle lovers in the Zurich region. Located next to the village of Kyburg, the castle offers a wide rage of experience beginning with it’s imposing view overlooking the river Töss and the surrounding landscape. Often remembered for it’s famous Iron Maiden, the resent renovations and changes to the exhibitions make this a wonderful castle to explore. A hidden jewel for treasure seekers. Perched on a small hill that overlooks the town of Beromünster, this monastery is a hidden jewel for treasure seekers that want to discover the truly charming village like atmosphere. A castle (from Latin: castellum) is a type of fortified structure built in Europe and the Middle East during the Middle Ages by European nobility. Scholars debate the scope of the word castle, but usually consider it to be the private fortified residence of a lord or noble. This is distinct from a palace, which is not fortified; from a fortress, which was not always a residence for nobility; and from a fortified settlement, which was a public defence – though there are many similarities among these types of construction. Usage of the term has varied over time and has been applied to structures as diverse as hill forts and country houses. Over the approximately 900 years that castles were built, they took on a great many forms with many different features, although some, such as curtain walls and arrowslits, were commonplace. A monastery is a building or complex of buildings comprising the domestic quarters and workplaces of monastics, monks or nuns, whether living in communities or alone (hermits). A monastery generally includes a place reserved for prayer which may be a chapel, church or temple, and may also serve as an oratory. Monasteries vary greatly in size, comprising a small dwelling accommodating only a hermit, or in the case of communities anything from a single building housing only one senior and two or three junior monks or nuns, to vast complexes and estates housing tens or hundreds. A monastery complex typically comprises a number of buildings which include a church, dormitory, cloister, refectory, library, balneary and infirmary. Depending on the location, the monastic order and the occupation of its inhabitants, the complex may also include a wide range of buildings that facilitate self-sufficiency and service to the community. These may include a hospice, a school and a range of agricultural and manufacturing buildings such as a barn, a forge or a brewery.